I have no new finished projects to share this week. 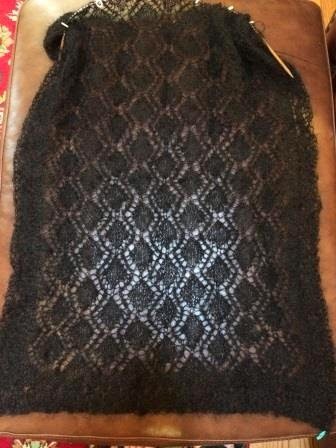 This is my current knitting project which I have been working on for weeks now. Still have many weeks to go as it is only about half finished. The pattern is Pleasing Reversibility in Lace by Jackie Erickson-Schweitzer. The yarn is Shibui Knits Silk Cloud which is very soft. The yarn can be difficult (as least for me) to frog (or unknit) when I make a mistake. One reason it is so slow going. It’s going to be lovely when finished. 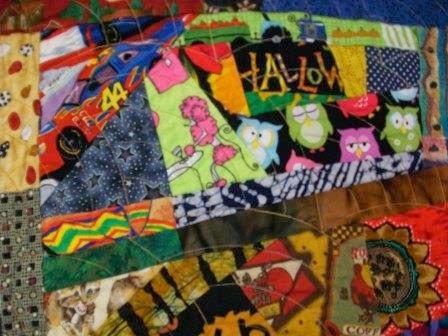 I'm working on another scrappy quilt which will be similar in size to the one I recently finished. Here are some photos showing some finished areas and some other others being planned. 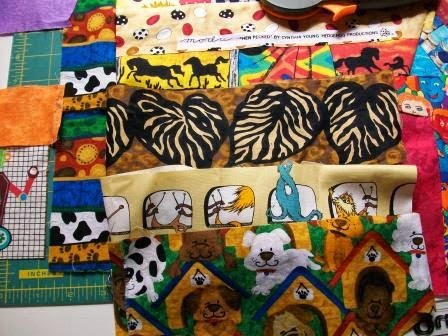 This first photo shows an area in planning featuring horses, eggs, leaves, Lorax, and dogs. 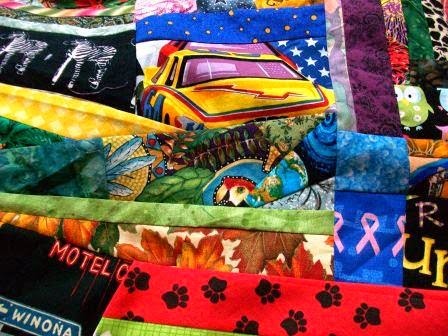 This area features a car, stars, a parrot head, an owl, dog paw prints, pink ribbon. 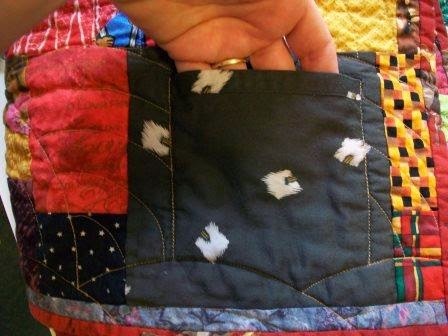 As with the last scrappy quilt, this one will have a working pocket. This area also features hearts, a razorback, thread spools, and more. 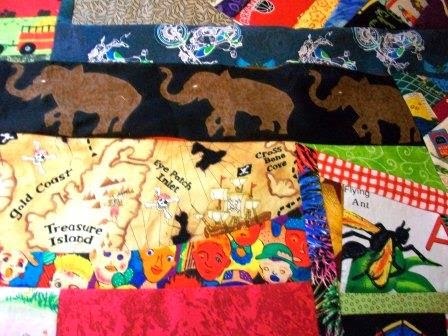 This are has motorcycles, elephants, a pirate map, faces, and a flying ant. 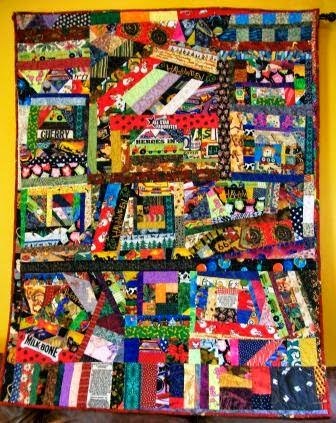 I finished another scrappy crazy quilt. This one measures 46 in X 58 in. 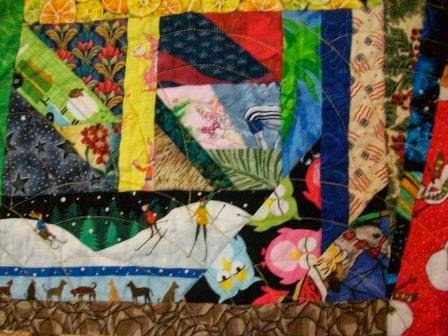 It's machine pieced and quilted. 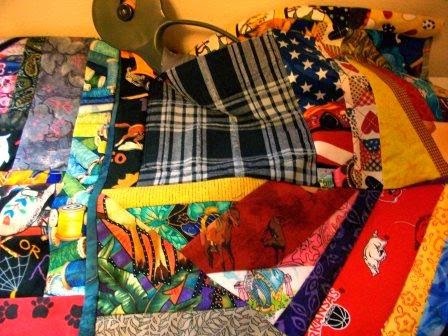 I have another one quilt of the same sort to make, then the two quilts will be going to a friend’s young boys. This next several photos show some points of interest. 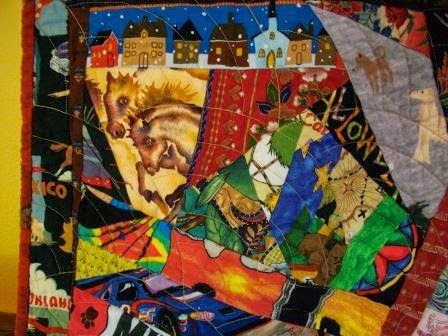 In this area of the quilt you find houses, dogs, horses, letters, and many primary colors. In this area – sheep, skiers, owls, dogs, flags, stars. In this area – race car, pink poodle, tractor, more owls, rooster, sunflower, stars, and more. There is a working pocket. 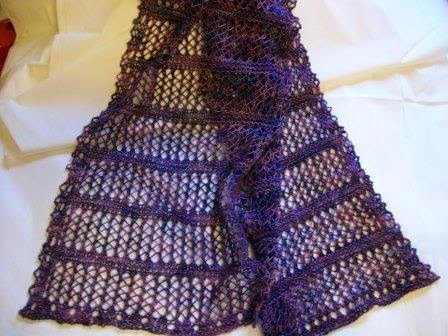 Another scarf using the pattern Wisp by Cheryl Niamath. 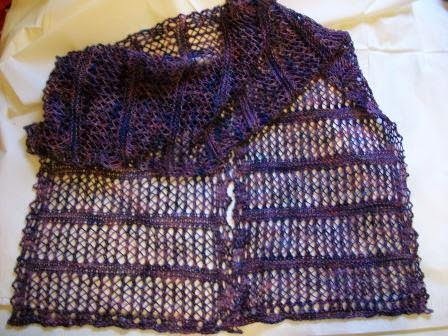 This one in a lovely purple wool yarn (Araucania Huasco). The finished blocked scarf measures approx 10 in X 68 in. 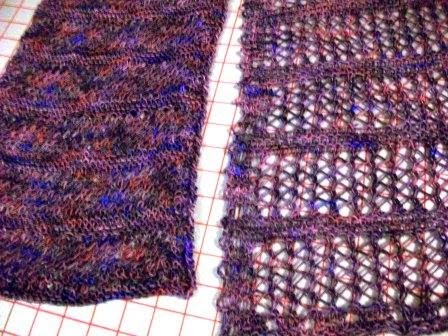 This first photo is of the scarf with one end blocked and the other not. These next two photos are of the scarf completely blocked. I am really please with how it turned out. The drape is wonderful.